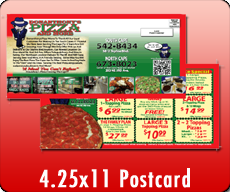 22 Every Door Direct Mail Qualified Products � BEST VALUES / BEST SELLERS are 4.25x11, 8.5x11, 11x17 BiFold. 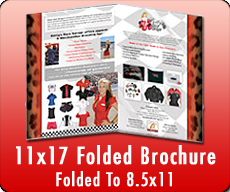 11x17 Bi-Fold Gives Most Square Inches For The Dollar. Yes, We Do Want To Talk To You! Yep, just purchase one of the 20+ eligible EDDM Printed Pieces and get FREE Professional Graphic Design that includes cutting edge marketing advice that works. Our goal is to assure every single penny you invest returns 10 to 100 times that amount. The difference between a poorly designed EDDM piece and one utilizing the most cutting edge marketing methods is HUGE. Okay, what is the catch? No catch, 100 percent FREE which includes professional graphic design, you only pay $47.41 for S&H. This truly is a $350+ value and is a great bonus for EVERY EDDM Order. What does Expert EDDM Marketing Advice Include? Once you place an order, if you like, can get FREE Cutting Edge Marketing Advice. What you will learn is what strategies are maximizing response rate for your industry - THIS ADVICE CALL IS WORTH MORE THAN THE COST OF THE PRINTING - After even just 5 mins, you will be blown away with what you learn. What Is The Most Popular & Effective EDDM Mailer? BY FAR, the 11x17 is the absolute best value - especially with our Gold Package - if you want the maximum Rate Of Return on your Investment. 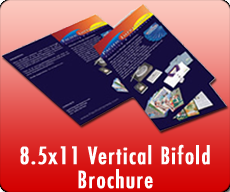 The 11x17 Bifold (Delivered as 8.5x11, 4 Page Catalog) cuts your cost per square inch in half from flat postcards, give you a huge presence in the mailbox and substantially increases response rates and profits. What Is The Smallest You Can Do With EDDM 18.3 Cent Mail? The smallest, and actually a cool piece, is a 3.5x11 Postcard, with or without a Tear Off Business Card - this is actually a great card if you really want to put a business card, coupon card, discount card or other offer into your prospects hands - the Tear Off Business Card is 160lb Mega Thick Stock - so probably nicer than what you currently may have in your wallet. Why Is EDDM only 18.3 Cents Per Home? EDDM is a courier route driven delivery program which means you can choose a courier route, not an individual house. Because of this, no addressing, bar coding, sorting or any handling of the mail piece is really needed. You literally take the mailing pieces to the post office, pay the 18.3 cent per home postage and within 24 hours, your pieces are given to the appropriate couriers and handed to each postal customer on the route. 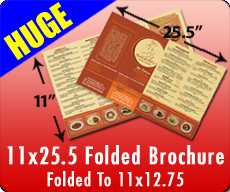 Did you know you can mail a 16 page catalog for 18.3 cents - if you are in a high margin business such as Real Estate, Home Improvements or Repair, Financial Services or any other business in where the more information, images and offers you communicate, the higher your response rate, you should really consider a 8, 12 or 16 page catalog. In addition to including lots of great information in a catalog, TALK ABOUT IMPRESSIVE IN THE MAILBOX - Instant Credibility Creator. How Do I Maximize EDDM Response Rate? Focus on your prospect, take ALL EGO out of your advertising, no one cares about your company and your business�.initially - every part of your mailer should be focused on creating/outlining problems, providing solutions to those problems and KEY, providing compelling reasons to act right away with strong call to actions. Follow up on a regular basis - mail the same zip code every month or two versus just once, your response rate will go up with every subsequent mailing. What Do You Do, What Do I Do For Any EDDM Order? Good question�.We do 100 percent of the work from graphic design, printing, shrink wrapping and shipping to your front door. 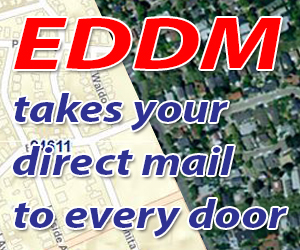 What we do here that no other company does is show you how to make your EDDM Mailing Piece Work. You only have to take the pieces to the post office, tell them where you want them to go and pay the 18.3 cents per home postage. You first have to give us ideas on how to maximize the effectiveness of your marketing piece - and we will help you along the way. 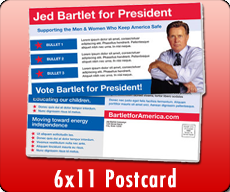 Once your piece is approved, within 3 to 5 business days our order will ship - during that time or even before, you need to go to www.USPS.com/eddmtool and create your facing slips (click here for template) to put on the bundles of a 100 you will receive. If you purchase 10,000 pieces, you will get 100 bundles of a 100 - all you will have to do is either use stickers to put on the bundles or print the info on regular paper and tape the info on - whatever is easier for you - as long as you have the info on the slip on each bundle. Then, finally, just take the bundles to the post office that delivers to the zip code you are targeting, write them a check for the postage and then wait for your order to go out the following day.